Automatic web image downloader. Download all images, music, video from any website in batch mode - just enter a website address and let Extreme Picture Finder do the rest for you. Plus built-in web picture finder allowing to search the web for pictures using keywords. Create and upload professional web photo galleries with a couple of mouse clicks! Even if you know nothing about the HTML and image processing - the result will be outstanding! Simply choose your pictures and let Extreme Thumbnail Generator do the rest of the job for you! Free screensaver for Windows: photo slideshow screensaver plus wallpaper downloader in one product. View your favorite photos from local or network folders or let the screensaver download fresh wallpapers every time it is turned on - just choose what kind of wallpapers you want and enjoy beautiful slideshow with more than 200 transition effects. Generate and save a list of similar URLs easily! Just enter your URL template, set up the varying numbers and your list is ready! Later this URL list can be used by programs like Extreme Picture Finder or any other download manager. Endless Slideshow Screensaver is now available in Italian! Simply download and install the interface translation module: Interface translations. 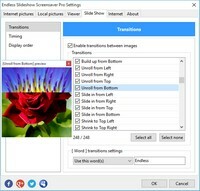 Endless Slideshow Screensaver 1.14 released with the support for Ultra HD (4K, 8K) TVs and monitors. Extreme Picture Finder 3.43 released with the ability to work with multiple selected projects - you can now delete, move and start all selected projects at once. Endless Slideshow Screensaver 1.13 released allowing users to play music files in the background while slideshow is running. 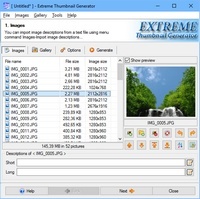 Extreme Thumbnail Generator 2.1 was released today allowing to create responsive thumbnail galleries inside the <ul> tag, without using <table> tags at all. Endless Slideshow Screensaver 1.12 released with the ability to use currently shown picture (blurred and stretched to fill entire screen) as the background for the slideshow. Another language is available on Endless Slideshow Screensaver website. This time it's German: https://de.free-photo-screensaver.com. Endless Slideshow Screensaver website is now available in Russian. More languages are coming soon. Also Endless Slideshow Screensaver 1.10.2 was released with several important updates. Extreme Picture Finder 3.40 released with a new option allowing to use page title to create sub-folders and other small improvements. Extreme Picture Finder 3.39 released with improved web picture search speed, new option in project properties allowing to rename files using Windows-style, ability to download all projects in any category automatically one after another and resume the category download right where it was stopped. Extreme Picture Finder 3.38 released with automatic check if newer versions of project templates downloaded from the online database are available. Extreme Picture Finder 3.36 released with a complete re-work of the URL Monitor window. Extreme Picture Finder now has a YouTube channel with video tutorials. Extreme Picture Finder 3.35 released with a brand new projects tree showing projects and searches, possibility to run all projects (or searches) in a category automatically, one after another, and a new projects database, and many smaller improvements.